A way for writers to be heard! Leapfrog author Vickie Weaver is a Green Mountains Review finalist for her short story THE SHOOTIST. The story will be printed in the fall issue of Green Mountains Review. Vickie Weaver is the author of the novel “Billie Girl,” a must-read for those who love dark Southern humor. It’s not too lat to enter the 2014 Leapfrog Fiction Contest, which closes on May 1st. Entries will be accepted until the morning of May 2nd. 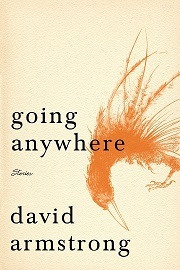 Novels, novellas, and story collections, both adult and children’s. Our judges are reading manuscripts night and day, and we look forward to receiving many more over the last few days of the contest. Judging will continue through the month of May, with winners announced in early to mid-June. There has been another great loss to the world with the death of Gabriel Garcia Marquez on April 17. We note that Peter Matthiessen, writer and explorer, died last Saturday, April 5. He was 86-years-old and fought leukemia for several years. See the link for an in-depth discussion of his life and his works. Here is a response from one of our followers, Townsend Walker, answering the question, “What is Your Favorite First Line?” Please send us your own favorite lines! The March issue of the Leapfrog Press newsletter The Treefrog Tattler, is now available for viewing! 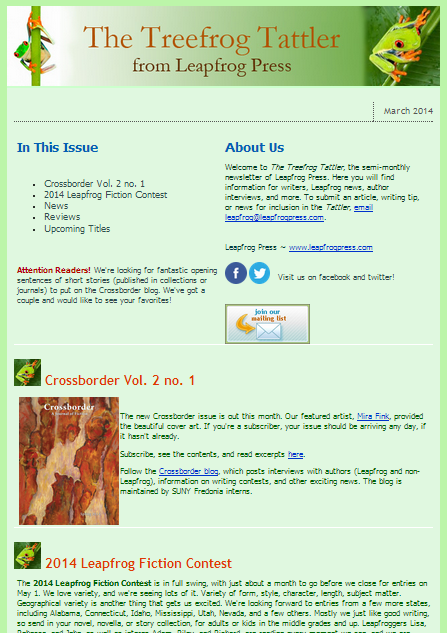 Find about more about our Crossborder magazine, the 2014 Fiction contest, reviews, upcoming titles, and other news. If you would like to subscribe to future issues of our newsletter, click on the link below and sign up.